With visitors in from Illinois, one of the things we talked about doing was going to Wendover. While my guests weren't super big gamblers, they did want to watch all the NFL games and one of the best places to do that is in Nevada. It didn't take much arm twisting to get me to go, despite the last few Wendover trips being somewhat lackluster in terms of luck. In order to get to the early action (i.e. the 11AM games) we opted to leave at about 9AM. Everybody was on time and after a quick stop at the bank we hit the road and had smooth sailing. We arrived just after 10:50. Our first stop was to Montego Bay. I pulled in and grabbed the player's club cards and activated them for the day as well as printing out $10 of free play and a free buffet pass (actually 2-for-1). It was a long line on account that everyone was activating their cards and preparing for the big drawing; Montego Bay was celebrating its 12th birthday and was giving away $500 to $1000 in free play as well as a brand new truck. They also had a spin and wheel deal and it awarded Shari and I 50 more tickets each to the drawing that evening. We all ate at the buffet and I don't think I pigged out as heavily as I normally do. I am not sure why not -- I came hungry, but it just seemed like I filled up pretty quickly. Shari played out our $10 in free play at Montego Bay and didn't get anything. We left our guests at the hotel so they could watch the game at the bar while Shari and I headed on over to the Peppermill. The Peppermill was a veritable ghost town compared to Montego Bay (and later the Rainbow). We pretty much had free reign over all of our favorite machines. 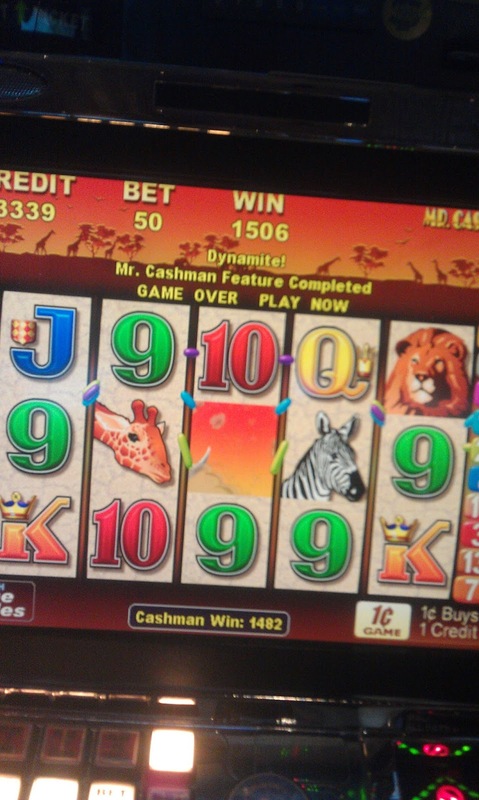 Unfortunately, it seemed like "luck" was absent from the casino as well. Shari did okay there, while the machines there had a virtual vacuum on my wallet. Bet high, low, fast or slow, I couldn't win. I was mildly pissed off when the guy next to me jumped on a Super Hot Phoenix and on his first pull got the red envelope bonus for $140. He didn't know what he had hit when he had done it. After about 45 minutes of losing, we jaunted over to the Rainbow. For once, my luck was mildly better at the Rainbow. Although I really wasn't having much success on any of my favorites. Sometimes I'd put in a $20 and make a meager profit, but more often than not it was a waste of time. I looked longingly at the poker table. They weren't offering anything special in terms of comps and poker would've been a solid choice, but the table was full. At least the poker deal recognized me and gave me a "hello" kind of nod. I did try some other games, including "Happy Lion" by Aruze Entertainment. 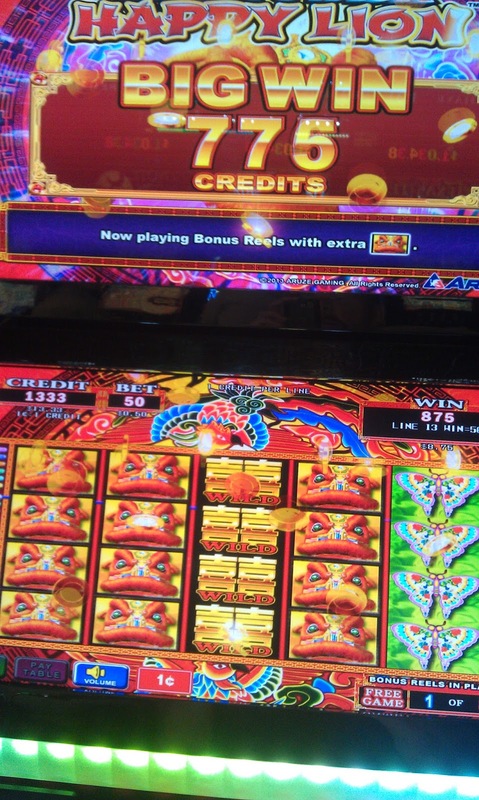 I had watched some people play this last time I was out in Wendover and it looks like you could make a killing on a bonus round; if you managed to get it. Luckily I did and won a little more than $35 on a 50 cents bet. On the plus side, the game did allow me to play a long time. 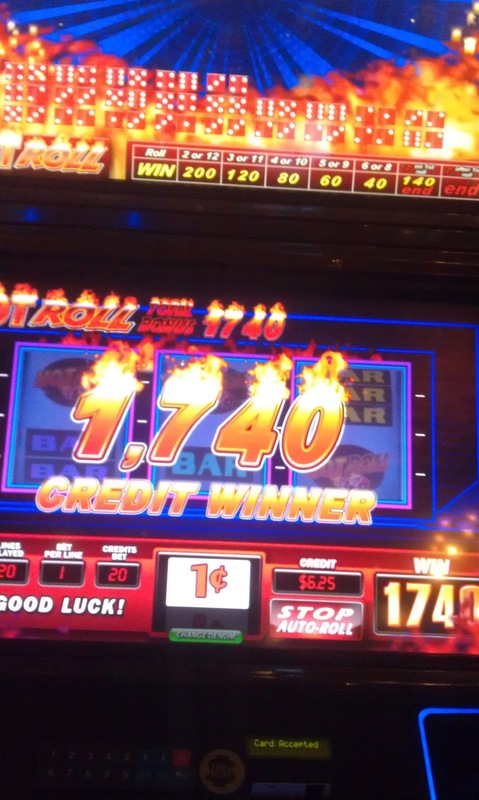 I also hit paydirt a few times on IGT's "Hot Roll" game. I wound up hitting the bonus round fairly early and usually you don't get much on it, but I managed to make sizable profits on a minimal bet. I dallied with the video Blackjack machines netting meager profits as well on those. Also Mr Cashman was incredibly generous to me. He seemed to be coming out quite frequently. While he didn't give me a lot of $, he wasn't a stranger either. 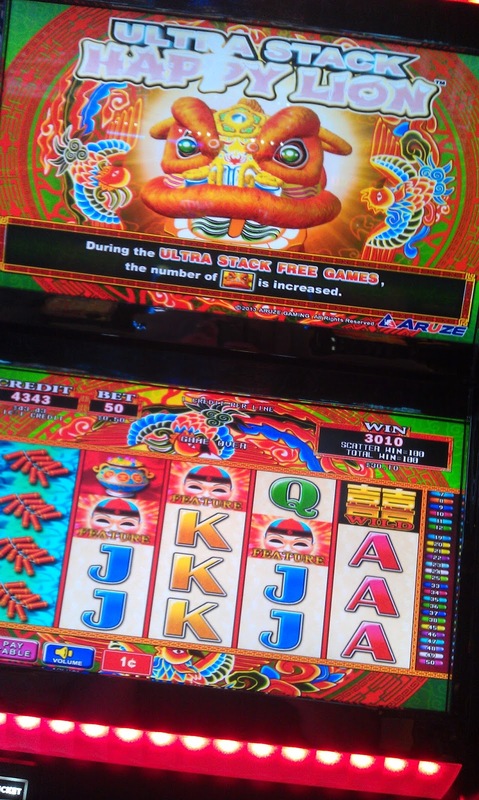 I was again miffed when a lady who was playing 38 cents a spin won nearly $1000 on my Fu Dao Le machine. I didn't think it was possible that you could win the Major jackpot on so little of a bet, but she did. We wound up killing most of the afternoon at the Rainbow and after the Bears won, we headed back over to the Montego Bay. We talked about getting dinner, but everyone (but me) was still full from the morning's buffet. 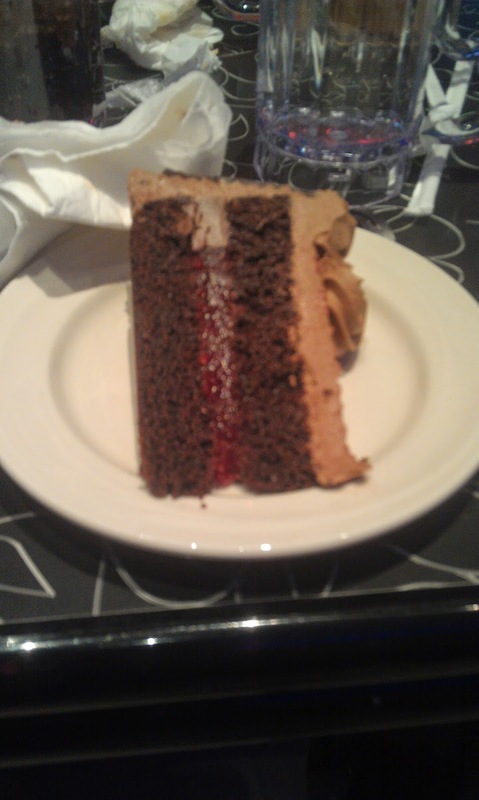 I was allowed to go get another buffet by my party, but I really wanted to hit the road and I didn't want to feel pressured to rush and eat, so I grabbed a Ho-Ho from the gift shop and hit the road. Sadly this was another losing trip. Between Shari and I, we probably lost $120 between the two of us (mostly me, however). I am not even sure this was a terribly fun trip, but since Shari's birthday is in October, they did give us $20 in restaurant money. I should get mine in November. At least we ate for cheap. I think we are done with Wendover until after the Vegas marathon. There really isn't any "must-see" shows coming up and Vegas is no longer the cheap getaway it used to be so we'll need to budget for that (even though the hotel and marathon at this point are paid for). I may go for my birthday in November and see Saigon by Night, however.